On May 1st, EMAG acquired the entire gear cutting business and related name rights from Richardon. This step continues to enhance the application expertise of the EMAG Group. Richardon is a leader in large-module gear production using gear hobbing and skiving processes. The acquisition perfectly complements the existing technologies in the EMAG Group. In recent years, Richardon has gained a reputation as a successful developer of machines for large-module gear cutting. This expertise was developed by the company, founded in 1974, through this performance in the maintenance and modernization of gear cutting machines from a wide range of manufacturers. Throughout numerous discussions with customers and after hundreds of machine customizations, it became clear that the company needed to create its own solution to fulfill customer needs. Therefore, 1997 founder Günter Richardon decided to design and build his own machine, and with that the RICHARDON brand of CNC gear cutting machines was born. From the start, the company has worked closely with customers to develop customized production solutions. 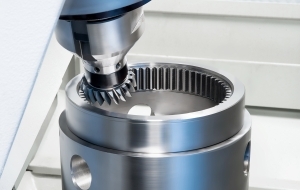 With RICHARDON's skiving technology, the EMAG Group is expanding its range of gear cutting technologies. Workpieces up to module 5 with a workpiece diameter of between 100 and 500 millimeters can be processed using this technology. Skiving is a highly efficient alternative for gear production. Especially when it comes to internal gears, it is much more efficient than broaching and shaping. The process is faster, and unit costs are lower,” explains Dr. Achim Feinauer, COO of the EMAG Group. “The technology improves our options for offering entire process chains. This provides our portfolio with a number of critical additions especially in the area of internal gears, as well as external toothing on shafts. The attractiveness of our product range for our customers is thus even further enhanced,” Feinauer concludes.